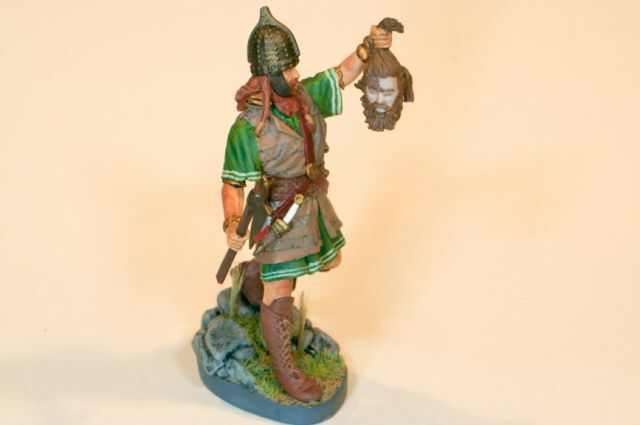 This article describes the painting of a 54mm miniature from Pegaso Models,the Celt Warrior of the La Tene period.The figure is sculpted by Pietro Balloni and is available from Pegaso or other miniatureretailers. The La Tene period is named after "the shallows" of Lake Neuchatel in Switzerlandwhere many Celtic artifacts and religious offerings where found.In the fourth century B.C. 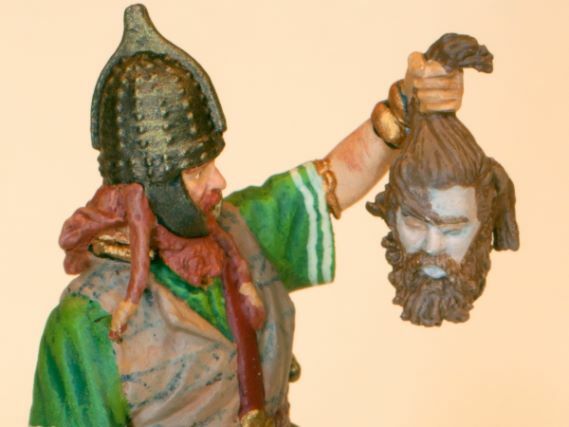 the Celts were flourishing throughout central Europe.In fact in 390 B.C. 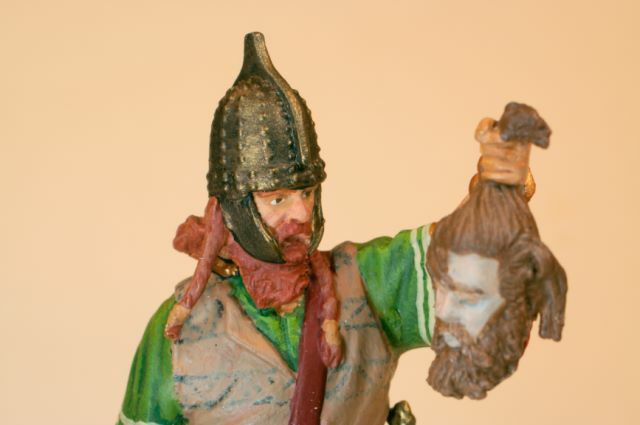 the Celts sacked Rome and the Celtic leader Brennus demandedhis weight in gold as a tribute.Some say the Romans never forgave the Celts for this defeat.The Romans under Julius Caesar and Hadrian devastated the Celts in later years. Here is the finished miniature.This figure is built straight from the box.Aside from painting, the only added item is a bit of static grass for the base.Visit the Pegaso siteto see an alternate paint scheme. 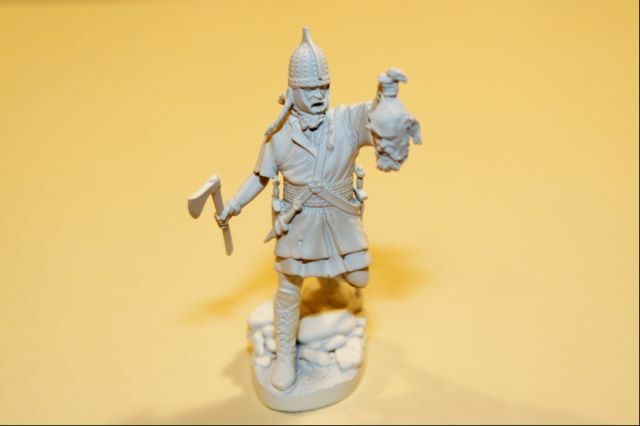 Although the box says 54 mm scale, this figure is really about 65 mm from the solesof the feet to top of the skull.So this figure will work as a display piece, but will not work as a figurefor miniature wargames unless you want a giant ogre of a Celt on one team. The La Tene period is one of great artistic advancement for the Celts.Long before reaching Great Britain, the La Tene Celts developed theswirling, twisting, intertwining style that is very popular Celtic art today.Also great metal jewelery, weapons, and armor were sought and traded for centuries. The first step in creating this miniature is assembling the pieces andapplying primer.The heads, arms, hands, torso, the base are the major pieces. It is recommended that you drill small holes and place pins toattach the hands.I recommend this after knocking off the left hand with the severed head fourtimes!Notice the rather dynamic pose is leaning forward to the edge of the base.If you knock the figure forward, the rather heavy model lands directly onthe severed head, and in my case cracking the super glue at the left wrist.Once pinned and glued, the wrist can support the entire weight of the model (and then some). 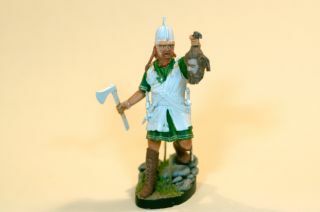 After the La Tene period came the great migrations of the Celts.They traveled from central Europe north to Great Britain,west to Spain, and east to Greece and Turkey.The Turkish capital of Ankarra is situated on the site of anancient Celtic hill fort. In this photo the flesh and hair of the figure has beenblocked in.Also the severed head has been detailed.I gave my Celt reddish hair as many historical texts mention about the Germans.I gave the Celt enemy head a bluish cast as if all life and warmth has left the head. Celtic helmets were known for their cheek guards and fancycrests.One Celtic helmet from Ciumesti has a metal bird with articulated wings.The wings flap up and down as the wearer runs or ride a horse. 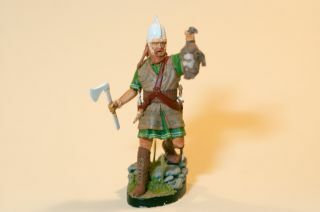 Here the Celt receives a happy green tunic with some spiffy yellow stripes.The boots are painted to represent soft leather.Also I decided to finish the base with somestatic grass and some sprigs of reeds. 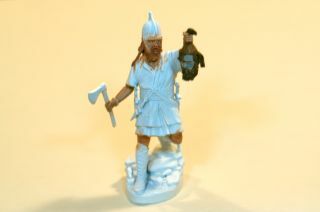 My second recurring problem with this figure was chipping of the acrylicpaint.I must have gotten some finger oils on the primed figure.The hair and base paints kept flaking offas seen at the base of this miniature.I guess part of the problem is that the miniature sat for 6 months in its primedstate waiting for me to complete other projects. The Celts were also masters of textiles.Although no dyed garmentssurvive, we know from historical texts that Celts lovedchecked, striped, and plaid patterns. Here the coat is completed and so are some of the belts.I imagined the coat as a light cow skin or goat skin chamois (soft leather)with a pattern applied.I tried to make the pattern faded from sun and rain.The belts are painted to represent tanned and polished leather. Most of the Celts of France and Germany lived in rectangular houses.Celts of Britain and Spain lived in round houses.Many archaeological sites have mapped out Celtic villagesites, and it is relatively easy to see the village layoutfrom the remnants of walls, fire place hearths, and post holes thatstill exist to this day. 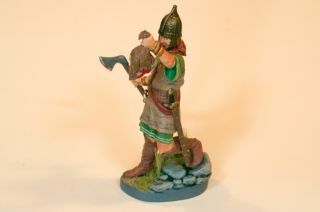 Here is a side view to show off the big bronze helmetand the lovely pair of daggers. 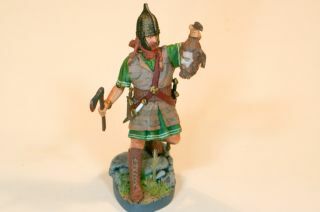 The La Tene period occurred during the Bronze Age, and therefore this Celt has a bigbronze helmet.This is before the Iron Age when ancient people discovered how to make furnaces andfire hot enough to melt iron.Also scale armor was available, but not mail armor.People had not yet discovered how to make wire for mail rings. Here is the big Celt from the left side with a nice view ofthe curved war axe.It is interesting to compare this authentic axe head to thefantasy and imagine war axes of today's media. One question that has stayed with me since childhood is"do you paint blood on your miniature's weapons? "When I was younger, I always did.Now almost every weapon I paint is clean and blood free.Since this figure gazing into the face of his enemy, I thoughtit would be good to paint blood on the axe and the victim'sneck to reflect the victorious moment in the battle. 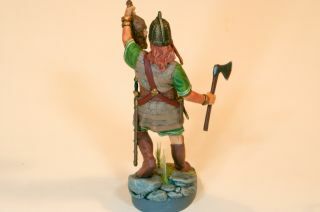 Finally here is the rear of the Celt.This sculpture certainly has lots of bling-bling.Note that there are 3 wrist bracelets in this photo,plus each bicep has a torc, and then there is a neck torc as well.Plus the swords and harnesses all have expensivemetal works on them.This Celt is no peasant! Here is another close up of the figure's upper body.At this magnification every tiny detail shows.I doubt many people my age can focus on a minithis closely.I certainly see many more problems in the photos thanI do in handling the mini in person:metal not metallic enough, lines not straight enough,tiny missed spots.Ah well, it looks good from an arm's length away.There's no sense in losing my head over this. I hope you enjoyed reading the details of the paintingand photographing of a large miniature of a Celt from the La Tene period.Perhaps these hints will help you get a head in painting ancient warriors.More miniatures-related articles are atDan Becker's Miniatures and Models site.Thanks for stopping by and reading about my miniatures. Last modified: Thursday, 09-Jun-2011 12:54:19 MST.